A very lively event. Jerry Asher introduced himself and told about his journeys around Arizona to promote Driving Electric. He showed off his Tesla toeing the original 2011 Nissan Leaf. We had a cool photo backdrop made out of NDEW signs and had a few Tesla model X Shows. Everyone in the restaurant was interested. we were a hit! Meet and Greet with TEVA Ambassador Jerry Asher. Hop in your EV and pull up to Sir Vezas Taco Garage for a meet and greet with the famous EV Promoter and Ambassador to TEVA, Jerry Asher. 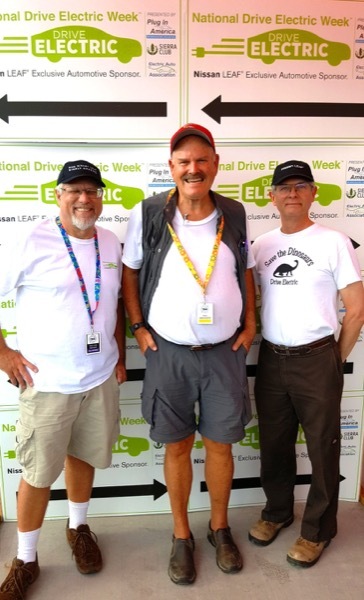 Jerry has made many yearly trips throughout the state of Arizona in his original Nissan leaf to inform cities, towns, business, and attractions how to join the electric revolution. He has also spoken to many schools and organizations about how easy it is to drive electric. He will be embarking on his next journey right after the event, driving a Tesla towing a Leaf! So don't miss out on this chance to hang out with an EV legend! Gifts and photo-ops are on the menu. Bring your friends. Let's kickoff National Drive Electric Week at the Taco Garage. Registered attendees report 52,500 electric miles driven.